A while back, I awoke in the night with words in my head. I wasn’t having a dream with images and colors and actions. Only words were there. I didn’t see the words; I heard them. This sort of thing happens to me occasionally. Sometimes I wake with words in my head. Sometimes, as I’m drifting off to sleep, I hear words. Nothing pops me out of almost-sleep faster than my mother’s voice saying my name. Of course, I immediately realize my mother is not in the van (or wherever I happen to be sleeping) with me. These days, my mother and I aren’t in the same state or even region of the country. Yet my nearly sleeping brain tells me I’ve just heard her voice saying my name. Is this a memory my transitioning-to-sleep brainwaves translate into an auditory hallucination? When this happens, am I closer to sleep than I think and actually dreaming? Usually, I don’t remember the words my brain has given me in the night. Years ago I had a dream journal and a pen with a little light in the tip. The light allowed me to see just enough to scribble my dreams (or dream words) on the pages of the journal. Using a small amount of light allowed me to stay more asleep than awake. I could drift off again easily once the recording was done. I tried to find one of those pens a couple of years ago when friends gave me money for Christmas and said I should buy something I really wanted. I wasn’t able to find one of those pens on the internet. The woman at the local school supply store couldn’t find one through any of her suppliers. I haven’t been writing down my dreams in the last few years. But these words came through so clearly, and I was able to hold onto them throughout the night. I wrote the words down in the morning. Here are the dream words: He who keeps his eyes closed is always in the dark. I wondered if I’d read this sentence somewhere, but a Google search brought no results. Perhaps I read it on the slip of paper from a fortune cookie. I have no recollection of seeing it before, but there it was, spit out from my sleeping brain and hung onto all night so I could write it down in the first fragile daylight. He who keeps his eyes closed is always in the dark. I’ve driven on mountain roads in North Carolina, Kentucky, Tennessee, and New Mexico, but I’d never before seen roads like the ones I’m encountering in the Sierra Nevada mountains. These roads have so many twists, turns, curves, and switchbacks. For the first few weeks, driving these roads made me carsick. I’d never gotten carsick while driving before. My body must have adjusted because I’m not getting carsick while driving these roads anymore. However, I know the curves are on my mind because I dreamed of one on a recent night. In the dream, I was driving my van. In the dream, I was driving my van too fast. I was also fiddling with something (my MP3 player, I suspect), not paying proper attention to the road. I was on a curve sooner than I expected, and I took it too fast. Next thing I knew, I was off the road, barreling through the grass. I don’t remember trying to stop the van. I do remember crashing through the wall of a barn. I felt the forward motion clearly. I felt the resistance of the wall clearly too. At that point, in that weird way of dreams, I was in the back of my van, lying in the bed. The van was still moving fast, and I knew the outcome was not going to be good. Then I woke up, relieved to realize I had not actually crashed my van through the wall of a barn. I was lying in my bed in the first feeble light of dawn, waiting for my heart rate to slow so I could try to get back to sleep. That’s when I heard the hooting of an owl. I hadn’t heard an owl hoot since I arrived in the Sierras in May. But here was one hooting long and loud moments after I’d dreamed of taking a curve too fast and wrecking my van. 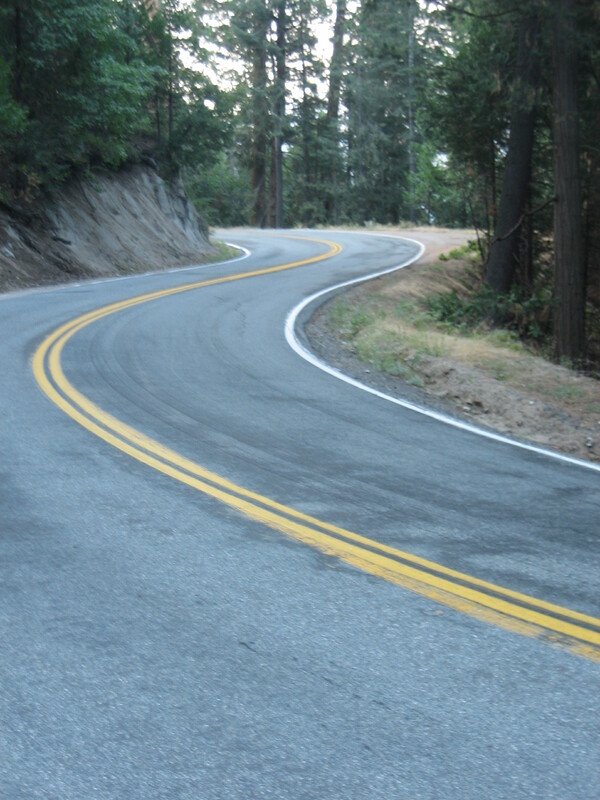 You can bet the next time I drove those twisty mountain roads, I took the curves nice and slow. 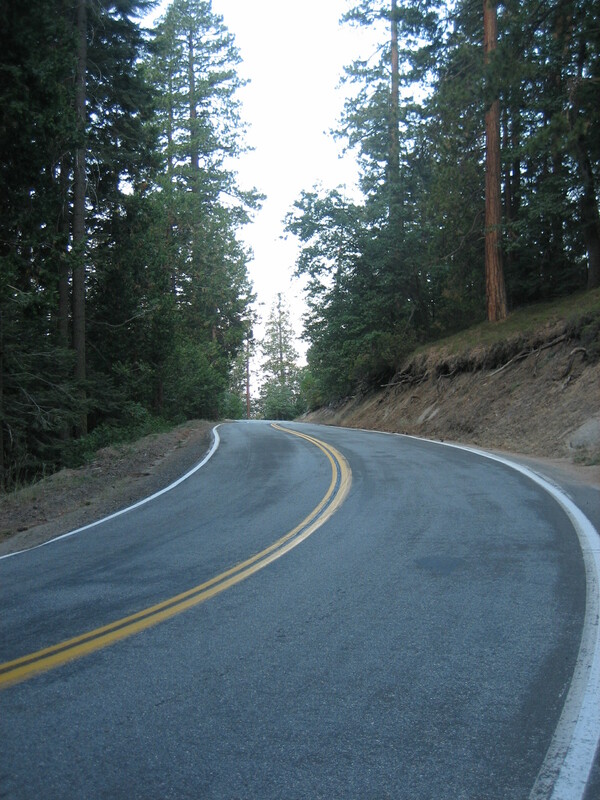 I took these photos of curvy mountain roads.